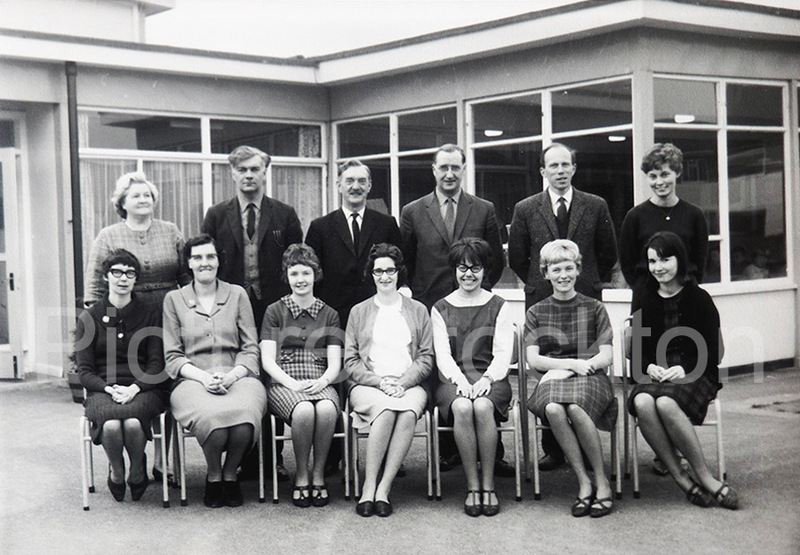 Teachers at Roseberry School, Billiingham during the mid 1970s. Back Row: Jenny Golightly (her husband James was the first headmaster at Billingham Campus Stephenson Hall), Ian Archer, Bill Jewit (Headmaster), Paddy O’Neill, Miles Sharret, Barbara ?. Front Row: Jean Bell, Rita Turnbull, Christine Vayro, ? ?, Pamela Botcherby, Eileen Regan (nee Alderson), Enid Stalley. Photograph and details courtesy of Pamela Botcherby and Bruce Coleman. I’m a former pupil and spent some of my happiest years there. Mr. Jewett used to take a couple of us with him in his car when visiting other schools. I really loved Miss Turnbull and forgive her for giving me the ruler for rubbing out with my finger! We used to think she had eyes in the back of her head because she could see what we were getting up to whilst she was writing on the blackboard. It was years later that I realised she could see our reflections in her “winged” specs! I think that Mr. Sharret was my favourite teacher though. Happy days… Also, my Mum (Sylvia Platts) worked in the school kitchen along with Ada Swain who was the head cook. I attended Roseberry infants and juniors with my last year being in 1962. The two teachers in this line up who I clearly remember are Ian Archer and Mr Jewitt. Ian Archer taught me in my final year and was known as Archie to his pupils. Very well liked and just about my best ever teacher. I’m still in touch with other ”old boys” who fully agree with this. Mr Jewitt was a different kettle of fish and you didn’t want to finish up in his office. Plenty of bark and a dab hand with the cane should it be required. In my last year the school had an excellent football team which won the league and cup double. Willie Maddren was our star player and he scored both goals in the cup final. Has anyone got a team picture to put on the website and bring back a few memories?. Other players I can recall include Colin Fawcett, Vernon Shrimpton, Alan Purkiss, Bob Day the goalie, Peter Bolton, and John Hugill. Mr Archer was my favourite teacher along with Geoff Boddy at Bede Hall. Remember Mr Archer reading us Sherlock Holmes stories? I seem to think Jean Bell was the teacher who gave me the ruler for spelling Wednesday incorrectly. Married to the infamous Mr Bell the Geography teacher at Bede Hall. Could hit a boy at the back of the class by throwing a board rubber. He used to go a strange shade of puce when angry. Remember the itching powder incident? Put on the toilet seats in the girls toilets at Roseberry Juniors. Mr Jewett was furious. Happy days when we all walked home from school on our own! I’m pleased to say that I don’t recall the itching powder incident at Roseberry. I can remember hitting a cricket ball across the field straight under the grass cutting machine and the ball came back in slices. The game was up so to speak. Jean Bell as shown in the photograph was a Miss Brooker in our time at Roseberry and as you say she married Clive Bell. I always got on OK with Mr Bell and in later years knew him socially through the Billingham Wine Circle. He was always with Lenny Hall the Physics teacher. Top row, second from left Mr. Archer, who was a very nice human being.